>Women are here invited to delight us, showing pics (or just describing them if they prefer don't publish photos) of their favorite specimens from their collections. The start of this topic is the Gail's collection. >She was so kind to offer us some pics of their specimens. TAK, of course you are invited to join us too! >The idea is not as a kind of race among best specimens, just the more loved specimens for any reason, although those specimens are not "top". I will entice more women to come and post on your site, it is nice to be able to talk AND show off some of our favourites! I loved this specimen when I saw it on the Westward's show case. I said everybody that this was one of my favorites when I saw it. I'm pleased that you like so much too! Ex Irv Brown collection. Photo by Jeff Scovil. Most of the photos you will see were taken by Jeff Scovil. Roughton Gill Mine, Cumbria, England. When I first purchased this I hadn't the love of it that I have now. It is a beauty and I appreciate it greatly. One of my favourites! Got this one from Peter Lyckberg. We have become good friends and attended his wedding this past year in Sweden. Malmberget Mine, Gallivare, Lappland, Sweden. A beauty amongst beryls, this is 15 cm long. Brice Gobin says this is his favourite in our collection. 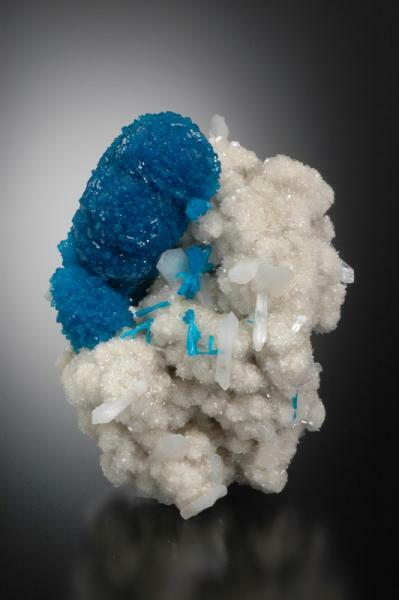 We have a number of aquamarines, but this is the one that knocks my socks off! Jim and I got this when it was dirty, needed trimming and was a bit larger than we normally like, but we had it cleaned and trimmed and absolutely love it! 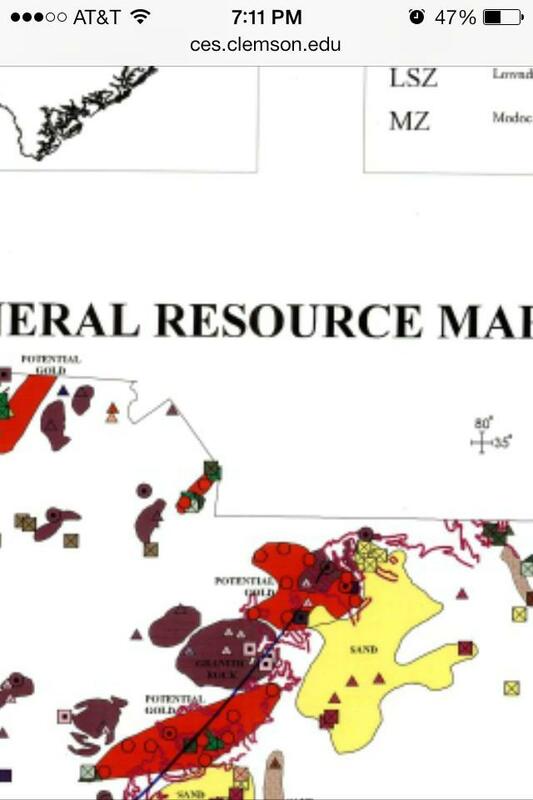 I have made a point to collect a number of specimens from this mine. We really almost said NO to buying it. When it was offered to us I was skeptical, it was not very attractive. We decided, overnight, to keep it and see how it would clean up. It has five water inclusions, which is great fun when showing to the grandchildren. 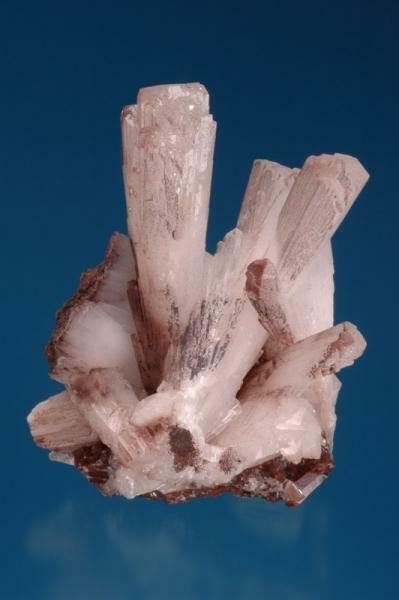 The gemmy terminations of the two "main" crystals is a bonus as many can be found with a milky inclusion, as you will see evident in the "thumb". There is something so wonderful about Cavansite! What rich colour. This was one of our earlier pieces, when we had been collecting for less than a year. I was so drawn to the fact that Nature had produced something so richly BLUE! I notice that non mineral people really are drawn to it. I didn't pay a whole lot of money for this, but it really took my breath away. I saw it on an internet site and took a gamble that I would love it as much as the photo, well...I did. It is superb with a gemmy face at the top and an etched face on back and front. 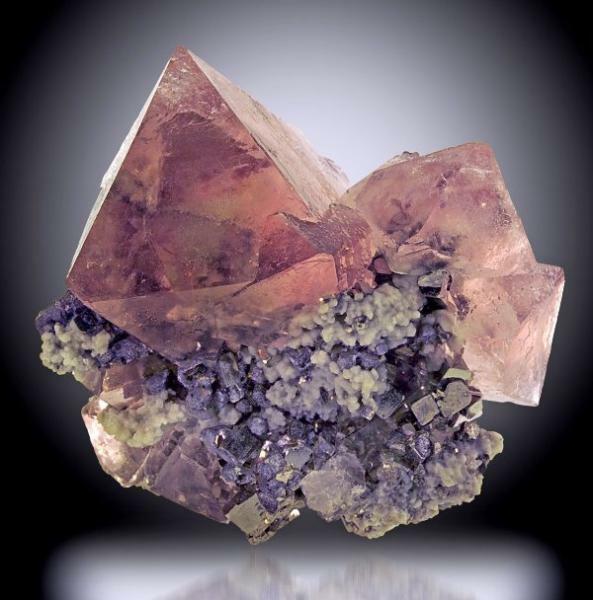 I find fluorites to be fascinating, they often catch my attention and each has its own special appeal. 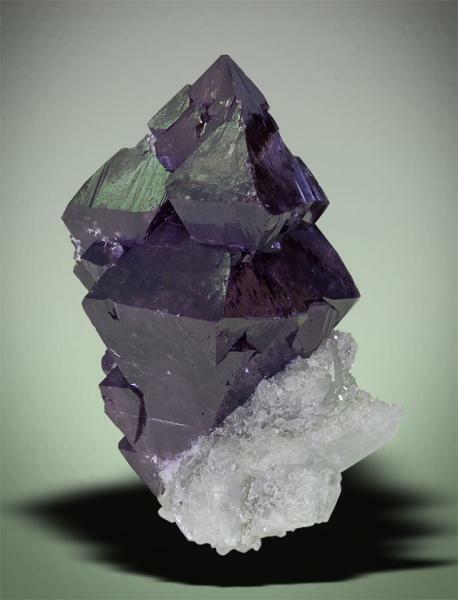 Fluorite, (spinel twin) included by pyrite and quartz. We had no idea this was to be a cover piece for the Mineralogical Record last year in January. It was an extreme honour. 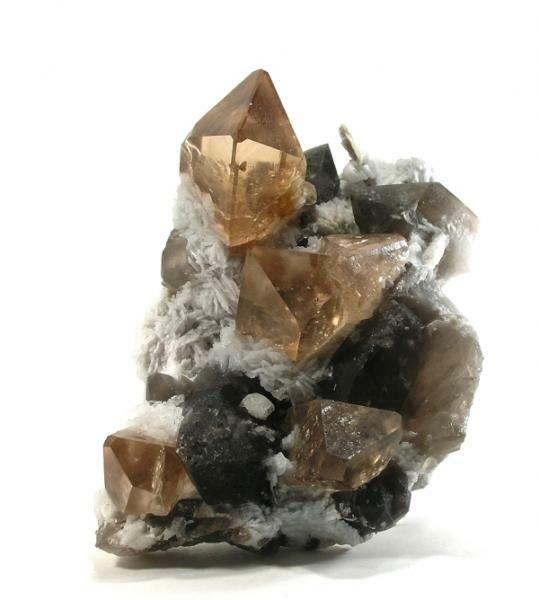 Topaz, Smoky Quartz and Albite. I have quite a nice collection of Hemimorphites from Mexico, and this is one of my all time favourites from that suite. From Rob Lavinsky. Ex Ed David, Evan Jones and Bob Jones piece. We thought this was an unusual combination and it is just very pleasing to the eye as well. Both Jim and I found it a "must have" for our collection. It is a miniature in size. The combination of the two colours is divine! John might know this piece, it is from the Smithsonian's Museum of Natural History. I found the formation to be very pleasing, the interaction of the Baryte to be almost puzzle like. Nature continues to amaze me, and this piece is also my Daughter-in-Laws favourite as well. Until seeing this I was underwhelmed by most Barytes, but this was something that we truly loved adding to our collection. Stunning! Frizington, West Cumberland Iron Fld. 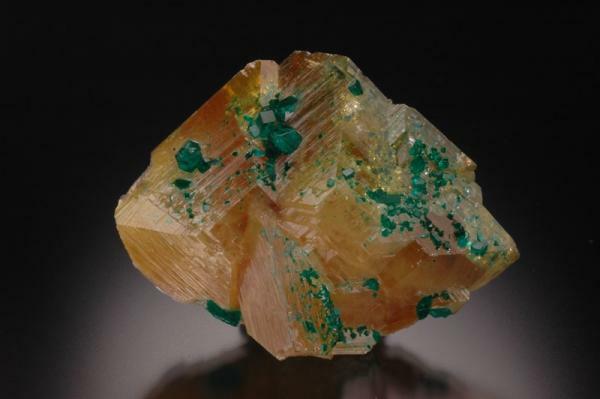 If ever there was a "pretty" mineral, this is it. 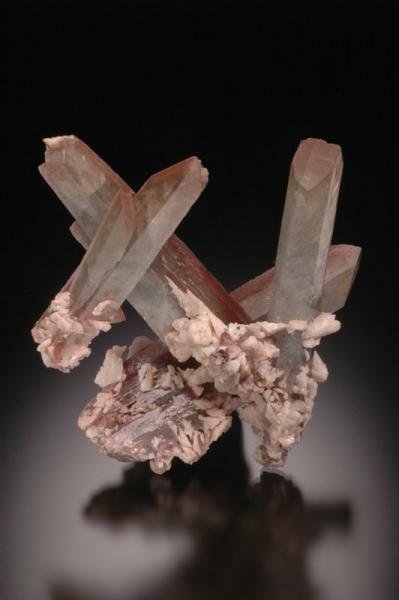 The Tourmaline jutting out the side of the Kunzite makes this specimen all the more unusual. 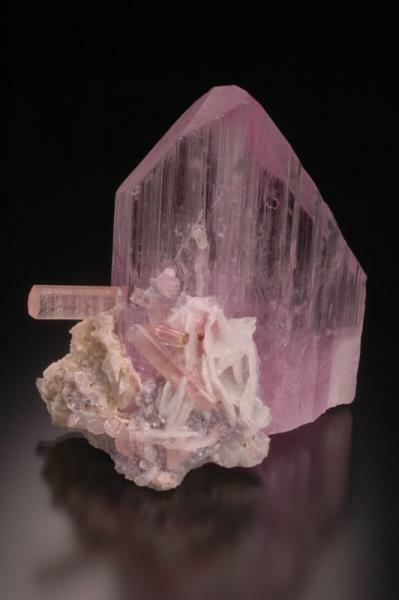 The sharp angle of the Kunzite is virtually damage free and makes a sharp impression on novice and old timer when they visit. Ex-Irv Brown collection, who happens to be one of my dearest friends. NOTE: Fred Wilda just painted this and it is being used by Marty Zinn for his show poster in Tucson this year. We are honoured. I have seen many Rose Quartz specimens, and many are nice but didn't strike a chord with me, this one...well, it was exactly what I was looking for. It did belong to Pete Bancroft, Dave Wilber, John Barlow and Irv Brown which is fun for me as I like to think that real men don't fear pink! 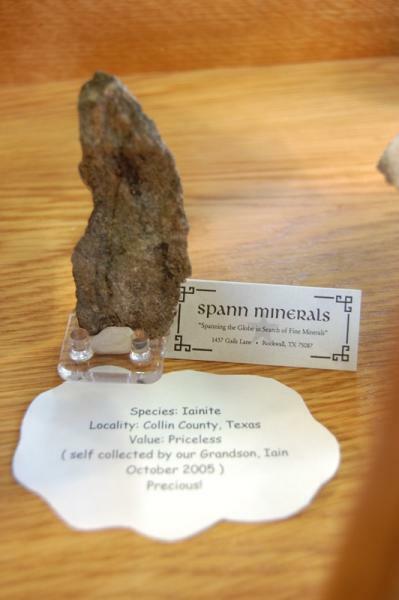 It was featured in the Bancroft book as well as John Barlows, but it is truly a Spann mineral as I can't imagine parting with it! This was used in my women's talk at the Westward Look this year. I keep a cut gemstone next to it to add to the fun. 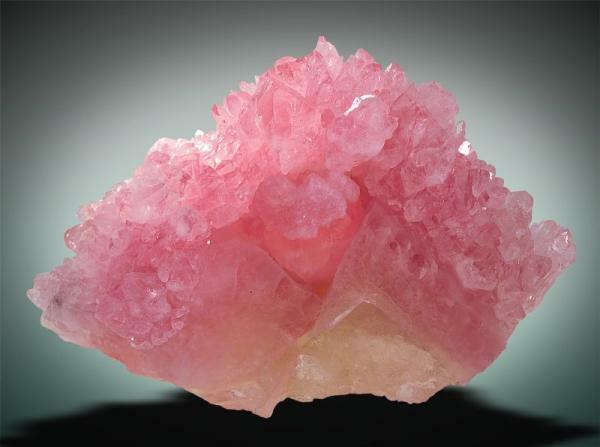 One of my top ten beloved specimens is this gorgeous pink fluorite from Peru. It was on the cover of Mineralogical Record in June/July 1997. It was a Marty Zinn piece at the time. It was also in the Bruce Oreck collection. We acquired it from Stuart Wilensky in 2007. It takes my breath away. I love the fun provenance, but it is the mineral that must win my heart and admiration first. The first photo is an unusual colour of Scheelite. I saw this and bought it right away, it was a must for our collection! I saw it across Stuart Wilensky's room and walked straight over to it, admired it and knew that it was So different than the other Scheelites in our collection. It is also DT which only adds to its beauty. It was purchased in Denver of 06, our first time at the main show. About the second photo, we are blessed with having Wallace Mann in our MAD group. HIs taste in minerals is impeccable and we have managed to talk him out of a few! 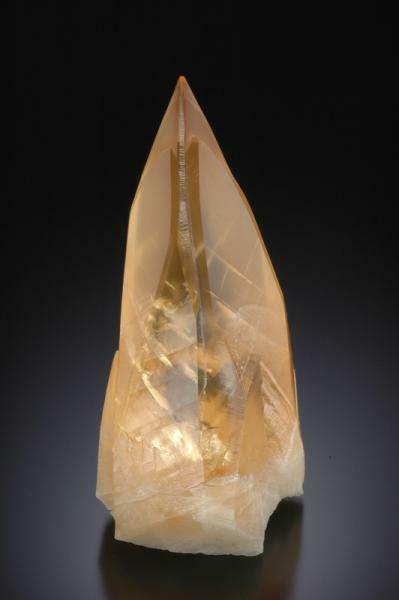 This Quartz var. 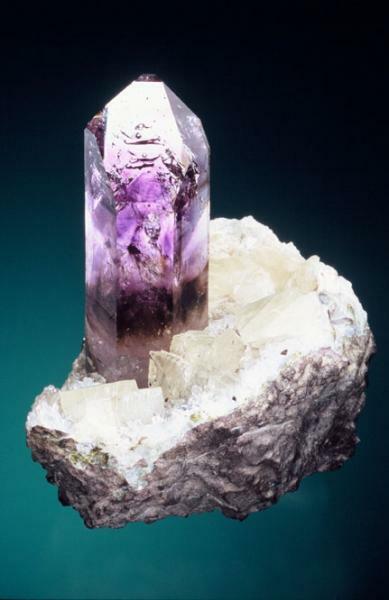 Amethyst is one that I treasure. I know that there has been much debate on labels and who owned minerals before us, and this is a case of being honoured to have Ex-Wally Mann specimens. Yaogangxian Mine, Chenzhou, Yizhang Co., Hunan, China. This is our most PRICELESS piece in the whole Spann collection. I would no sooner let this piece go than I would my right eye. It is by far the most sentimental, generous and inspiring example of self collecting. This was collected, in Collin county, Texas by a 5 year old Grandson of ours, Iain. He was so thrilled to go out in our driveway and find a rock off to the side and present it to me as he said "Here Nanny, for your collection. Will you put it in your cabinet? " Tie Die, yep, this reminds me of a beloved tee shirt I had in my hippy flower child days. The combination of blue and purple is still something that puts me in awe, Nature is amazing. 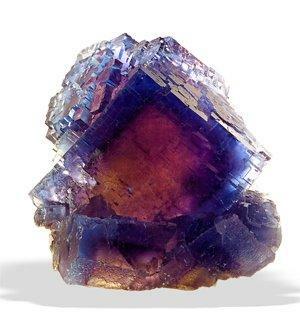 I think fluorites are a bit easy to like, there are so many variations, localities and sizes as well as shapes. What's not to like? In this case, what's not to love? This is beautiful all the way around. We display it in a cabinet with glass on all four sides. It looks as though snow has fallen on it and the two variations of colour make it a draw for non mineral visitors, as well as well seasoned collectors. 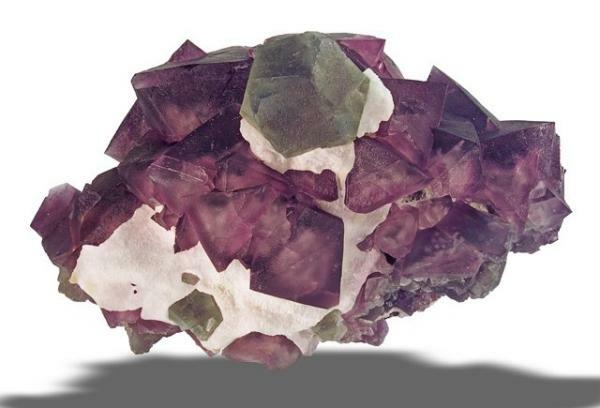 A large transparent green lustrous dodecahedral xl ( 54x52x35 mm) with a bit of white matrix sits on top of very big intergrown cluster of very large transparent lustrous purple octahedral florite xls up to 75 mm on edge, with several smaller green fluorite xls found on both the front and back side. Ex Stuart Wilensky, Steve Neely collection. The first photo is of a Japanese Stibnite that has quite a history. It is, really, an ( as Jordi says) UNordinary piece, but it is featured in the Barlow book on pages 14,15 and 16 as titled "Oddysey of a Mineral Specimen". There is rather a sad tale that goes along with the mineral. 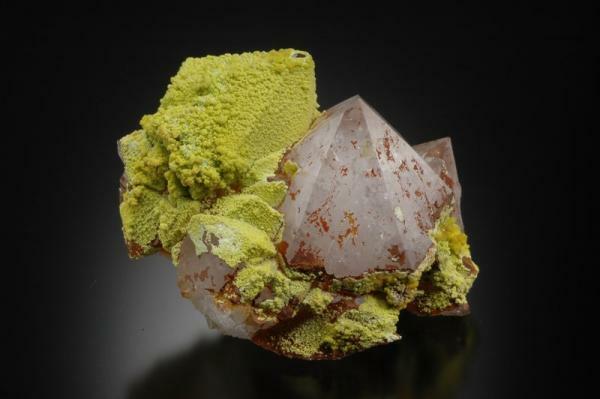 It all started with the piece originating in the collection of Dr. Daisuke Tanaka, who obtained the specimen from the mine ( Ichinokawa Mine, Saijo, Iyo Province, Shikoku, Japan ). Tanaka died in 1954 ( the year I was born interestingly enough... ) and the specimen then went to Phoenix, Arizona dealer Dr. Ralph Mueller, who in turn sold it to Arch Oboler of California. Oboler was a writer and was involved in the radio program " The Shadow" when Orson Welles played the lead. When Oboler was having construction done on his home for an addition a heavy rain fell and his young child fell in and drowned. It ended his collecting days and Paul Desautels and Martin Ehrmann outmaneuvered Ed Swoboda in acquiring most of the collection. But this piece wound up in the ownership of Ralph Mueller and his son, Jim, took over the business after his father passed away. The specimen was then sold to Harry Roberson, noted collector, who later won a series of local and national awards with his collection. 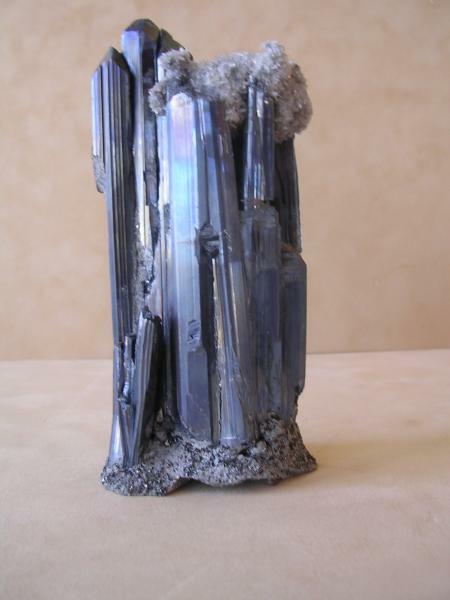 The stibnite was often displayed in his cases. When Roberson downsized he placed the specimen back with Mueller on consignment. It ended up in the hands of a retired priest, Father Raymond Lassuy of Phoenix. John Barlow then entered the picture. 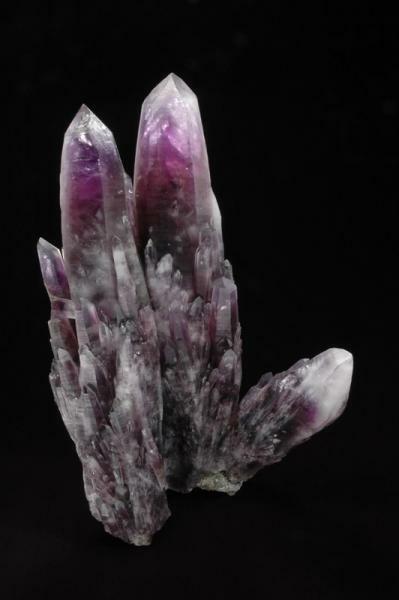 He was in Tucson and had been looking for a good Japanese stibnite and was talking to Ron Vance, the priest overheard and struck a deal to sell the mineral to John. We eventually purchased it from Rob Lavinsky and have owned it for three years, it is listed in our catalog as number 5. We wrote to Barlow's grandson and were given copies of letters from the priest and from Bob Jones of Arizona to add to the story. 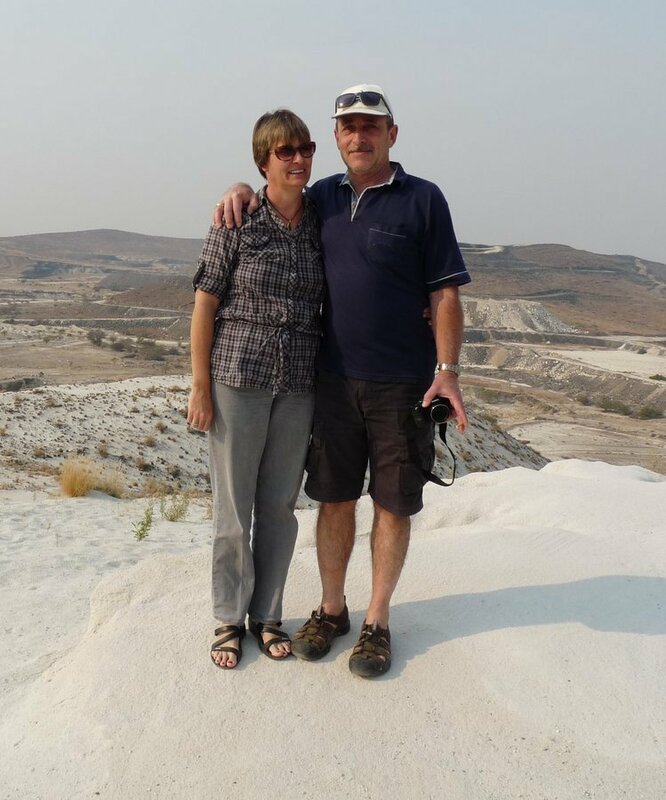 it is special to Jim and me as we feel that we are caretaking in a long line of caretakers. It is wonderful to know so much about a specimen and it gives me a great story to tell as well! PS. I had the pleasure of unpacking many of Charlie's specimens , to help out a friend after they were sold, and I got to put this aside to purchase. 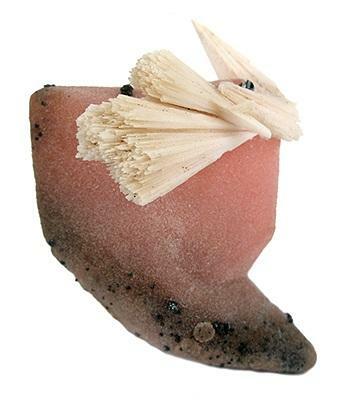 ( 35 x 33 x 15 mm ), with a neat vertical groove down one side and a second butterfly twin xl "foot" perpendicular to the primary twinned xl, of either manganoan calcite or of a rhodochrosite pseudomorph, and with a sprinkling of lustrous black manganite faceted micro-xls and a colour zoned cleaved calcite xl. 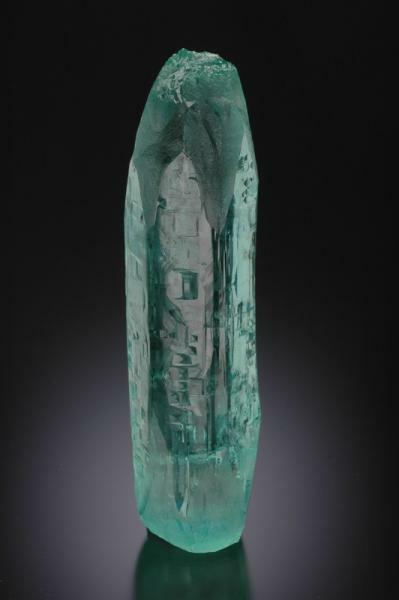 Two short comments: the Stibnite is not "an ordinary piece" at all. Is on matrix, and specimens on matrix from Ichinokawa are extremely scarce. Folch's collection own some, all of them great (he flew to Ichinokawa to buy Stibnites when he knew that those specimens were mined there) and your piece not only resist the comparison but I consider it equal or better than the ones from Folch's collection. 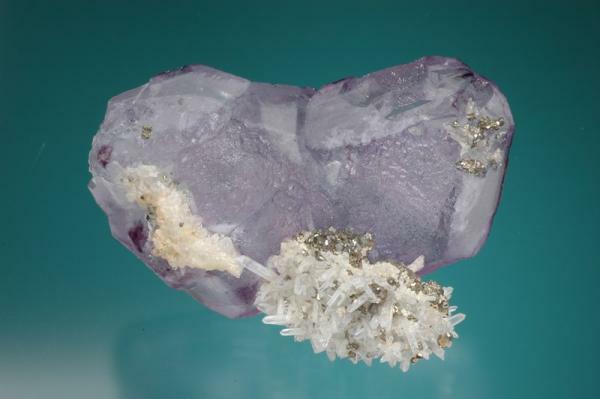 The second comment is about the "Kutnohorite". I analyzed several of they and all of them are not Kutnohorite but a mix of Rhodochrosite and Kutnohorite. Maybe some could be a real Kutnohorite, but the ones that I analyzed have this peculiarity. Japanese minerals are one of my passions, so I'll take the liberty of commenting on your stibnite. Much larger ones have come out of the Ichinokawa mine in the past, but yours is far above average as far as aesthetics goes! I particularly like the characteristic little quartz druses on it too, which help distinguish the Ichinokawa stibnites from those of other localities (although they are only seen on few Ichinokawa pieces these days). On your locality label, "Ehime-ken" (correct spelling) is the current prefecture name, which was "Iyo province" up until the early 20th century, but they cover the same area, so it's a bit redundant to have both. Since Japanese stibnites command significantly higher prices than chinese ones of similar size, some scam artist once in a while tries to pass off a chinese specimen as japanese. In the case of your specimen, given its known history, and its appearance, I have no doubt whatsoever that it is truly from Ichinokawa. Do you happen to know roughly when it arrived in the USA?